The Sikh homeland is the Punjab, in India, where today Sikhs make up approximately 61% of the population. This is the only place where Sikhs are in the majority. Population of Sikhs in the world is around 27 million. That makes Sikhs 0.39% of the world population. Out of these 27 million approximately 83% live in India with 76% of all Sikhs living in Punjab.This is the only place where Sikhs are in the majority. Other Indian states where Sikhs have substantial population i.e greater than 200,000 are Haryana, Rajasthan, Uttar Pradesh, Delhi, Maharashtra, Uttaranchal, Assam and Jammu & Kashmir. Outside India Sikhs are almost everywhere. Sikhs have emigrated to countries all over the world - especially to English-speaking and East Asian nations. In doing so they have retained, to an unusually high degree, their distinctive cultural and religious identity. The existance of Sikh communities throughout the world presents a fascinating story of an immigrant community which originated in the Punjab, India, more than five hundred years ago. As everyone knows, male Sikhs are easily recognized by their turbans and beards (but all men wearing turbans are not Sikhs). Over the centuries, they have acquired a reputation for being sturdy, hard working and adventrous; they are a people who have earned the reputation for being extremely brave and loyal soldiers. Sikh migration from India began from the 2nd half of the 19th century when the British had completed their annexation of the Punjab. The British Raj preferentially recruited Sikhs in the Indian Civil Service and, in particular, the British Indian Army. This led to migration of Sikhs to different parts of British India and the British Empire. During this era, semiskilled Sikh artisans were also transported from the Punjab to British East Africa to help in the building of railways. After World War II, Sikhs emigrated from both India and Pakistan. Most went to the United Kingdom but many also went to North America. The main factor for Sikh migration has been economic. Significant Sikh population now resides in United Kingdom, Canada, the United States, Malaysia, East Africa, Australia and Thailand. Most of Britain's Sikh population immigrated either from the Punjab in the 1950s and 60s, or from East Africa little later. The first recorded Sikh immigrant in Britain was Maharajah Duleep Singh. Duleep Singh was the last ruler of the Sikh kingdom in Punjab. After Punjab was annexed by British Maharajah was dethroned and exiled to Britain in 1849 at the age of 14. But the main immigration of the Sikhs to Britain happened in the 1950s. These were mostly the men from Punjab seeking work to fill the shortage of unskilled labour in Britain. Most worked in industries like foundries and textiles. These new arrivals mostly settled in London, Birmingham and West Yorkshire. People wanted to leave the Punjab not just because they have oppurtunities abroad, but also because of the chaotic aftermath of the 1947 partition of India into the secular but largely Hindu state of India and the Muslim state of Pakistan. This partition mainly affected the Sikh homeland of the Punjab. There was bloodshed and destruction as millions of Muslims, Hindus and Sikhs tried to cross the border to the safety of their own communities. Punjab changed from a settled and prosperous area to a violent and overcrowded zone. Many Sikhs left from west Punjab in Pakistan to move to east Punjab in India, while others left India altogether. The Punjab was disrupted again in 1966, when India further subdivided it into 3 parts, with the creation of the states of Punjab, Haryana, and Himachal Pradesh. The migration from East Africa was the result of the move to Africanise countries like Tanzania, Uganda and Kenya, depriving many Asians of their work, and in many cases expelling them altogether. The Sikhs who migrated from East Africa had a different attitude to the outward symbols of Sikhism. They continued to wear them as they were already used to living as an expatriate community in Africa for over 70 years. They were accustomed to being a highly visible minority. And also most of them were highly skilled and employable, in contrast to the mostly labour oriented migration from Punjab. The presence of a group of Sikhs who took pride in being members of the Khalsa encouraged others to return to the five Ks. This strengthened the identity and the visibility of the British Sikhs as a whole. It was in 1902 that the first Sikhs arrived in Canada. They came as part of a Hong Kong military contingent travelling to the coronation of Edward VII. Some of them returned to Canada, settling in British Columbia. A population of more than 5,000 South Asians mostly Sikhs, came to British Columbia in this period. Immigration was then banned in 1908. This resulted in population gradually decreasing to 2,000. Despite facing discrimination, Sikhs quickly established a strong community in British Columbia. they created the Vancouver Khalsa Diwan Society in 1907. In 1908 Sikhs built their first permanent gurdwara. Later Gurdwaras were built in New Westminster, Victoria, Nanaimo, Golden, Abbotsford, Fraser Mills and Paldi by 1920s. Sikh communities in Canada usually developed around the gurdwaras. Through the gurdwaras Sikhs provided support and aid to community members in need. Gurdwaras organized the Sikh communities in their fight to have the immigration ban overturned. Which resulted in wives and children of legal Sikh residents to be allowed into Canada in the 1920s. In 1950s Sikhism in Canada underwent further changes as the immigration resumed. In the 1960s and 1970s tens of thousands of skilled Sikhs settled across Canada, especially in southern Ontario from Toronto to Windsor.With increasing Sikh population, gurdwaras were established in every major city eastward to Montreal. The number of Sikhs living in Canada in the year 2004 was about 400,000. In 2011, the Canadian Government revealed that they had estimated there to be at least 800,000 Sikhs living in Canada. Sikhs started immigrating to the United States in 1897. Some came straight from India, while others from the far east. By 1910 there were thousands of Sikhs living in California and the other western states. Majority of these were singles as they couldn't bring their families due to strict immigration laws. They were neither allowed to buy property and land. Majority either returned to India or married women of Mexican ancestry to stay. These early settlers mainly worked on agricultural or railroad construction jobs. Some worked in mines and lumber mills as well. 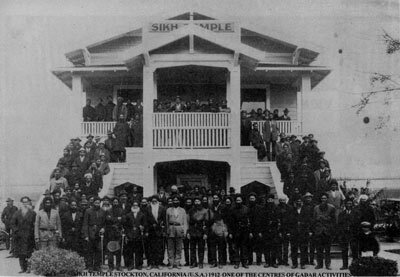 They built their first Gurdwara in Stockton, California in 1912. This Gurdwara is still in operation today. After 1915 due to the strict immigration laws, immigration of the Sikhs almost stopped . Sikh population dwindled. There were only few hundred Sikhs living in California as the second world war ended. Immigration laws were changed in 1965, which resulted in a new wave of Sikh immigration. Most of them were educated and they got jobs in almost every profession. Wherever they settled, they also built Gurdwaras. There are hundreds of Gurdwaras in the United States today. Some of them joined the US Army and proudly served. The Police forces in New York, Los Angeles, and the California National Guard have turbaned Sikh police officers. Since pioneer Sikhs got jobs in agriculture, they settled in California's central valley. Due to that, 10% of Yuba City's population is Sikh. Story goes that first Indian settlers to Australia came as part of Captain Cook's ship. These were the times when road transport was not yet developed in Australia.These settlers had come to Australia to run Camel trains. These were then called Afghans and they kept the communication and supply line open between Melbourne and the center of Australia. Earliest Sikh arrivals in Australia included Sardar Beer Singh Johal who came in 1895 and Sardar Narain Singh Heyer, who arrived in 1898. Many Sikhs took part in the rush for gold on the Victorian fields while majority of muslims worked as camel drivers in the Central Australian desert. Another wave of Sikhs arrived around 50 years ago when India and Australia both were British colonies. These enterprising Sikhs came to work on the Banana Plantations in Southern Queensland. Today a large number of them live in the town of Wolgoolga. These people have their own Banana Farms and are quite rich. Now there are two Gurdwaras in Wolgoolga. The third wave of Indians came about 25 years ago, just after Australia abandoned its Whites Only policy. Recently another big influx began with arrival of IT professionals. While most Sikh immigration was direct from India but when a military coupe took place in Fiji around a decade ago there was an influx of Fizi Indian Population. Today there is a large Fiji Indian population in Australia who call Australia there home. Since 98 A new wave of Indian immigrants has hit Australia. Starved of government funding, Australian education institutes started desperately recruiting full fee paying overseas students. Many of these students have paid large sums of fees and are looking for work to support themselves. There are many thousands of Sikh students studying in Australia at any given time. Sikhs have a vibrant punjabi music and dance culture, elements of which are infiltrating contemporary western music. The pulsating Bhangra music, once restricted to celebrate the harvest throughout Northern India, is now making its presence felt in dance clubs around the world. Bhangra music frequently tops the charts in the United Kingdom, Canada and the South East Asia.